Paramedic teams across the country are being asked to help London Ambulance Service (LAS) because it is struggling to cope with increased demand. 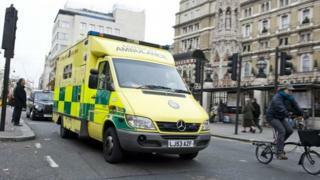 Last week was LAS's busiest ever with 11,008 call outs for the most seriously ill and injured. Previously help has only been asked for in circumstances such as the Olympics or the 2005 bombings, said BBC London's Karl Mercer. LAS said no help had yet been confirmed and plans would be reviewed. Malcolm Alexander, chairman of the Patients' Forum for the LAS said it was a "catastrophe". The service has more than 400 vacancies and has had problems recruiting people. Demand is up 15% on the same time last year. It is also missing response targets. It needs to get to category A calls, the most serious, in eight minutes but is getting to 80% of them in 11 minutes. In October, it received a record number of complaints - 144, compared with 43 four years ago. LAS said it contacted other ambulance services on Thursday to ask for what they call mutual aid or pre-planned aid, from other parts of England. A senior NHS source told the BBC emergency powers could be implemented by the Department of Health which would force other regions to help out if they failed to respond to initial requests. Mr Alexander said on Monday the service received 300 calls an hour, its highest level ever. He said: "It's an appalling crisis. It's up to ministers now to show some leadership. In the real world if you can't get the staff, you've got to raise the wages." He said he had witnessed a 66-year-old woman who broke her thumb falling over being told to go to an urgent care centre. He said: "It's not consistent with moral values. What if she couldn't afford a taxi? What if she had concussion?" London Mayor Boris Johnson told BBC London 94.9 he had written to the health secretary about the strain on the service. He said: "Anne Radmore [LAS chief executive] is doing a very good job but in very tough circumstances. She doesn't have the flow of young paramedics coming through. It's a failure in the training system." LAS said asking for mutual aid was "not unusual" and during the Commonwealth Games, London Ambulance Service helped colleagues in Scotland. Director of Operations Jason Killens said: "Like other parts of the NHS, we have seen significant increases in demand over the last few weeks as we enter the winter period. "Between 8 December and 14 December we attended 11,008 Category A incidents." He said staff were being offered overtime and members of the public with less serious injuries and illnesses were being urged to call NHS 111. He added the call for help was part of the service's "forward planning" and nothing had been confirmed at this stage. LAS has raised the pressure level to critical twice this year - on 13 October and 24 November when staff took strike action.